A cut of meat, typically sold as a boneless cut, that is removed from under the first five ribs in the breast section of the animal. The brisket in beef or pork is a tougher cut of meat so it best suited for braising and slow cooking, which allows it to cook for longer periods of time to bring out the flavor. The Beef Brisket is a cut of meat located between the fore shank and the plate of the beef carcass. A full sized Beef Brisket, which may weight from 8 to 12 pounds, is cut into two halves to make it easier to sell. One half is known as the Flat Cut or first cut and the other is referred to as a Point Cut or second cut. The Flat Cut, which may also be called the thin cut or brisket-deckel-off, is the cut most often sold as a brisket. It is leaner than the Point Cut of the Brisket. Despite being more lean, the Flat Cut does have a full layer of fat that runs across the surface of the cut, which helps the cut to remain moist when cooked. It is also the cut best chosen for making corned beef, which is processed from the Beef Brisket. The Point Cut on the Beef Brisket, which may be called the thick cut or deckel, contains significantly more internal fat running throughout the meat as pockets of fat. 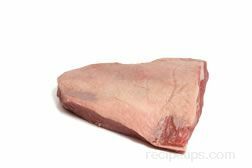 It is not a cut that is commonly found in many meat markets or food stores. The fat in both of these cuts helps to moisten the meat when the cuts are pot roasted, slow cooked or prepared as a London broil. When purchasing either the Point Cut or the Flat Cut, select or request pieces that have a fair amount of fat to keep the meat moist when cooking, since some butchers often trim the fat prior to selling the cut. For pork, the Brisket is not as large as the Beef Brisket. Bones within the brisket are referred to as the rib tips, which are the small trimmings cut from the pork spare ribs when St. Louis Style ribs are produced.